How can you tell if the Grignard reaction has initiated? Diagram 1: Grignard Reaction has NOT initiated in this picture. The reaction solution mixture is clear. At this point the reaction mixture should be heated. It is advisable to scratch or crush the Mg-turnings before placing them in the flask in order to have a fresh (=more reactive) surface. Diagram 2: The reaction has initiated. The solution mixture is opaque. This murkiness results from formation of the Phenyl Grignard which is only partially soluble in the diethyl ether. At this point the reaction continue gentle heating. (Though not common, if the reaction starts boiling too vigorously or out of control, then place in ice bath). Diagram 3: As the reaction proceeds, some browning my result. At this point the reaction mixture is clearly going on its on and should not be supplemented with heat. Start slowly dripping in the remaining bromobenzene solution while maintaining a gentle reflux. Diagram 4: At this point (about 20-30 minutes later), nearly all of the bromobenzene solution has been added and the reaction is no longer opaque (the increased volume of diethyl ether results in all of the Phenyl Grignard solubilizing). When all of the bromobenzene solution has been added, then the reaction mixture should be supplemented with heat allowing for a gentle reflux. 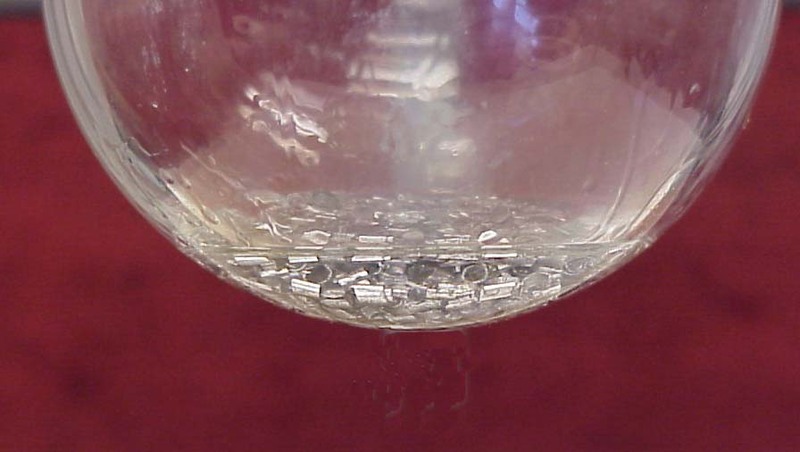 Ideally, most of the magnesium turnings will dissolve throughout the reaction. In some cases, the solution looks light brown, in other cases dark brown, often depending how fast the etheral bromobenzene solution was added.